FFG have some incredible packs and resources for their games below are some of the resources feel free to check it out! 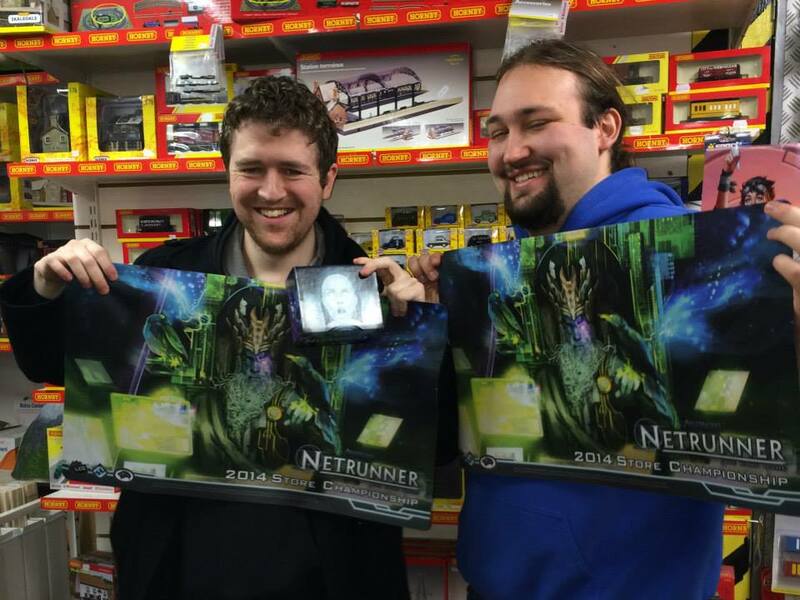 Yesterday ( Sunday 23rd of February) we had our first Netrunner Store Championships. The day began at 11, with our usual draconian rigid start times. There was a good atmosphere in the shop, no gaming event is quite the same without that aura of anticipation, excitement and of course sleep deprivation. 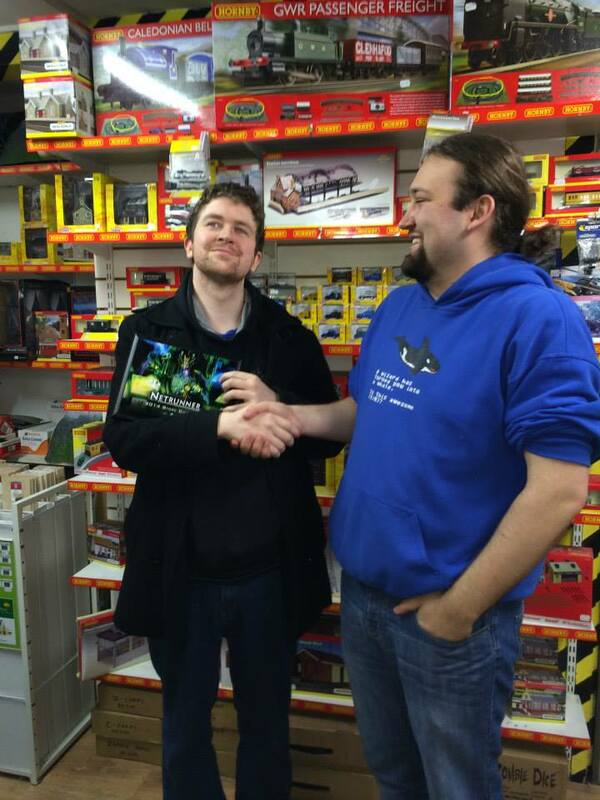 We would like to throw a big thanks out to Mike and Nicole from Netrunner Ireland who travelled down from Dublin to participate in the event, it was great to link up communities and get some games against players who had never before entered our shop! The player pool had a good mix of players, with some strong experienced players and enthusiastic neophytes who were more than ready to steal win from the experienced players. Two such new comers, Dave Parrot and Tony who until now had never come in to the shop to play the game and the latter who only picked it up two days ago, won a data pack each for being the most promising new comers. For the first match I played Mike, he brought Andromeda and Weyland two strong consistant decks. While I had my slightly more sporadic PPG (Powerpuff girls) Professor deck and the Townsville based NBN. So it was the big money, fracking, whale punching and all round black hearted corporation combined with the consistently successful criminal facing off against a tenured father of three professor with the backing of the local news company and their public face the loveable Jackson Howard. The Professor had recently featured in the heart warming award winning local show “Jacksons People”. Andromeda was quick off the mark stealing Agendas and playing solid with the news company keeping up with almost every score but that is the problem with journalism if you don't break the news then your just first loser. The game goes right down to the wire with both of us on Match point Mike takes it the local viewership are crushed but a quick word from Jackson Howard assures everyone it is going to be ok. In the second game the Professor quickly takes Weyland to school, keyholing their servers he manages to score a fast 6 points while the Weyland Directors frantically attempt to secure their servers. The Capitalist Juggernaut stabilizes itself with a fat bed of ill gotten gains and time runs out on the Professor cutting his curriculum short. A win for Mike and a timed win for me. For the day we would talk about a rematch after the unsatisfactory ending which unfortunately never happened but they were some great games. The rounds went on and it was surprisingly close the whole way through the tournament with a few dark horses threatening to get into the top 4 cut and net a beautiful matt. I will be talking to the finalists and hopefully we can add on some game reports from them both. The scores are being counted, Valsa and Ratchet take this opportunity to strike a pose for the benefit of those with flash photography or in this attendance those with teeth! After some long battles and much back and forth it is cut to a top 4, Myself, Dave Russel, Mike and J.K. I match off against Dave leaving JK to take on Mike. Daves Kit deck picks apart a disheartened NBN pulling agendas at every opportunity and rocketing to 6 points when he crossed the 7 I was only threatening the 4th point Dave wins 7 – 2. While I would love to tell you a tale of an inspiring comeback that is not at all what happened here. With only 3 points to score Dave scores it fast. We heard word Mike has beaten JK and with the lads final train approaching we get straight into the final. For my final paragraph I would like to get you all in the spirit of things if you could... like we did can cue this music in the background. A back and forward affair if there ever was one, the game coming so close at one stage one player threw his hand down thinking he had it won. 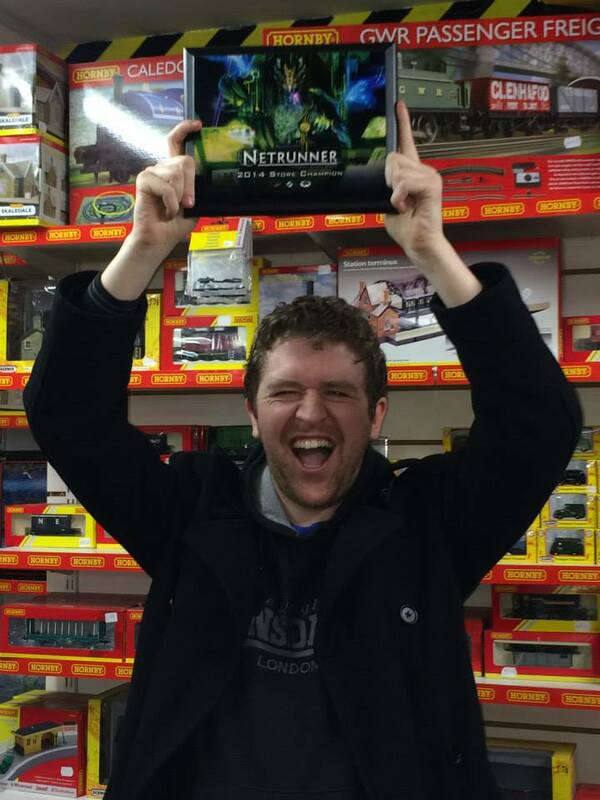 But victory was clawed from jaws we would like to give a big congratulations to the first Gathering Store Champion ... DAVE RUSSELL! It was a hard fought win our condolences go to Mike but having played Dave for weeks before the event every time being murdered by Weylands hired goons he was well practised. Oh how quickly Whale killing and fracking can be forgotten we all cheered on Dave as he prepared for the press photo op. Hey guys thought I would throw up this for those of you interested in Munchkin, it's an interactive online demo version of the game it's quite cool, definitely worth a look for anyone thinking of picking it up. It's just a flash game so it requires no install or anything check it out!